A recent discussion in one of my critique groups sent me back to my reference-of-choice for writing fiction, the book I would probably pick if I could have only one book on writing. This is the writing book I’ve read cover to cover twice and dipped into many other times. 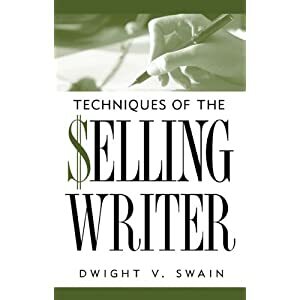 It was written in 1965 and updated in 1982 by Dwight Swain, a long-time professor at the University of Oklahoma, who gave it the slightly embarrassing title, Techniques of the Selling Writer. I’m sure he did it on purpose. There’s a no-nonsense, let’s-get-real quality to the book; show me a writer who wouldn’t like to get paid for prose. Motivation-Reaction Unit is the fundamental building block of an action sequence (it’s important to stress that it does not apply do description, exposition, or reverie). It’s pretty simple: something happens, the hero reacts to it, the situation changes, and something else happens. How characters react to events will largely determine their plausibility and how closely we bond with them. There’s a lot more to it than that, of course, but this is an introduction. The Motivation part is the easiest: something external happens, something apprehended by the senses. The house catches fire, a car almost hits me, the boss says, “You’re fired,” I pass a bakery and smell bread like my grandmother used to bake. The key point here is to chose events that are meaningful to the character or the story: a flight of Canadian geese overhead might change the life of a man in a dead-end job and a loveless marriage, who has always equated birds with freedom, but if the same man only worries about getting pooped on, why include it at all? The Reaction component is harder: it includes three events that Swain calls Feeling, Action, and Speech. Ingermanson calls them Feeling, Reflex, and Speech. I call them “Involuntary Response, Reflex, and Speech/Decision. In real life they can be virtually simultaneous, but in fiction we need to write them sequentially. Feeling, as Swain uses it, refers to an immediate, involuntary response – what do you do when a horn blares behind you? That is why I prefer “involuntary response.” It may be physiological – you jump out of your skin at the horn, but depending on the stimulus, it could be a memory – what does the smell of the bread bring up? Reflex or Action is a response I have some control over, and as such, will reveal more of my character than being startled by a loud noise. I may spin in the direction of the horn with clenched fists. Or grasp a parking meter to steady myself. Or count to ten. Or pull the gun from my shoulder holster. The key point Swain makes is that we don’t need all three responses to every stimulus; two or even one will do, but, the responses must come in this order, from least-to-most “rational” to avoid confusion. It makes no sense to say, “When I spotted Eddie Haskell, I drew my 38 and aimed at his head. I nearly jumped out of my skin when he blared the horn.” You get the idea. We want readers to feel what we want them to feel, and our greatest chance is usually through the protagonist. If the audience bond’s with our lead character, and the character’s responses to events are plausible, the audience will deeply experience what they experience. Huck Finn, Ebenezer Scrooge, Frodo Baggins. Swain has presented a template. Constraining? Yes, but like the constraints of a three act structure, or pigment on a rectangular canvas, I think there’s a lot of room for creativity within the MRU structure. I caught myself not long ago, relying too heavily on just the immediate and largely inarticulate visceral responses of my character to convey emotional states; it wasn’t working. When I came back to Swain I realized I had a pattern. I realized my approach wasn’t wrong, so much as it was insufficient. I had more work to do. We always have more work to do – it helps when we know what it is. This entry was posted in Characters, Writing and tagged fictional characters, plots, postaweek2011, writing. Bookmark the permalink.